With the formation of 7th Central Pay Commission, debates regarding salary hike skyrocketed. Everyone had a version to present. It was a telltale scenario of expectations – some logical, some illogical and some were mere ‘follow the crowd’ style of suggestions. Parallel to salary hike debates came another debate that was pretty much ignored – the debate on retirement age. Of course nothing else is sweeter than money and so, the debates and rumors regarding the retirement age didn’t really take the mainstream focus. But somewhere else it did. It sparked quite a bit of debate on WhatsApp as well as Facebook. So, what was the debate all about? People started saying that the 7th Central Pay Commission has plans on truncating the retirement age of central government employees by 2 years. This meant that if the plans were indeed true, the retirement age would be 58 years instead of current 60 years of age. A factual question! Did you know that 58 years was indeed the retirement age before the 5th Central Pay Commission came to force? The 5th Pay Commission came into action when the center was governed by NDA-led coalition government of which BJP was the most dominant force. Back then it was decided that the retirement age of government employees should be increased to 60 years from the then prevailing 58 years. However, there was a clause. The clause stated that a government employee should stay in service until he or she attains the age of 60 (after the increase in age limit) or should stay in service for no more than 33 years of services, which ever comes earlier. To explain further, suppose a person gets employed with central government when he or she is only 24 years old. Thus, according to the above clause, he has to retire at the age of 57 years because by then he or she will have completed 33 years of service despite the fact that the person did not attain the age of 60 years by then. What’s the alternate scenario? Here let us assume that the aspirant of the central government job is a person who is 28 years of age. Given this fact, the retirement age rule states that the person will have to retire after serving for 32 years because after 32 years, he or she will attain the age of 60. This means that though the person didn’t complete 33 years of service, he still has to retire since he or she will be hitting the retirement age of 60. Now, as the 7th Pay Commission came into action, the center is once again ruled by NDA government with BPJ earning single-handed majority. This time while most of the focus stayed on salary increase and also on One Rank One Pension issue, there was no scarcity of rumors regarding the retirement age. Some fake news started floating on social media that the 7th Pay Commission is planning on reducing the retirement age to 58 years. The same clause stayed here, which stated that a person has to retire when he or she attains the age of 58 years or when he completes 33 years of service with the central government, whichever comes first. All the rumors and arguments about this retirement age were simply blasted away by Ministry of Personnel, Public Grievances and Pension by just one letter. The letter clarified that the current government has no such plans of altering the retirement age limit and the associated 33-year service clause. A screenshot of the letter is given below which clearly mentions that no such plans were made. So, bottom line – retirement age continues to be 60 years and the associated 33-year service clause also stays valid for the time being, or at least until the next CPC comes into action. Now that we are done Indian Armed Forces, let us take a look at other central government jobs like Railways, BSNL, Income Tax, High Court, Supreme Court etc. Railway Employees 60 years. Special clauses are applicable, details of which can be found here. RBI Deputy Governor 62 years. IAS, IPS and IFS officers 60 years (some extensions may be allowed). ICAR or Indian Council of Agriculture Research scientists 62 years. ICMR or Indian Council of Medical Research scientists 62 years. Scientists at other central government research institutions 60 years. * Please note that the standard retirement age in all job categories in the above table is 60 years. Anything above 60 is a special case or an age determined for high ranking officials. Also, there are many for central government jobs that have different age limits for retirement when it comes to high ranking officers. It is literally not possible to sum up every one of them in this single article. 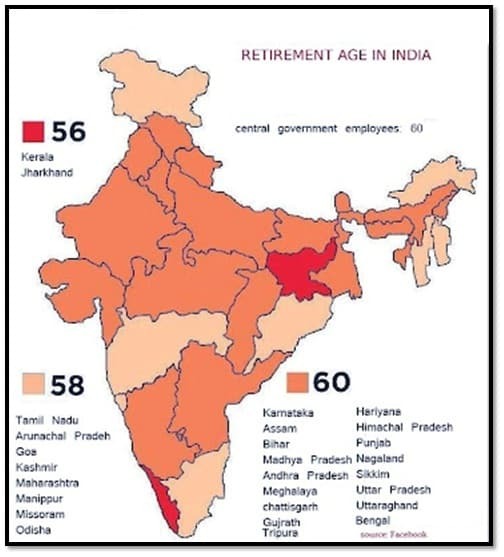 After central government, it is time to take a quick look at the retirement age limit for employees of state government in different state-owned organizations. *All professions include jobs like teachers, professors, doctors, nurses, PWD employees etc. within a particular state government jurisdiction. Of course there are clauses and special conditions applicable under certain circumstances but pointing them out in this article for every individual state in not possible.